The Urban homestead vegetable garden. 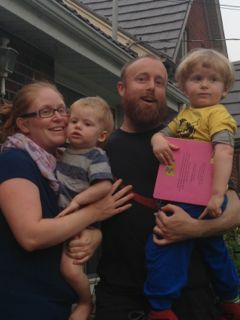 I was welcomed into their urban homestead in London, Ontario by Sarah, Matt and their two small boys Tobin and Mitchell. London was my only Canadian garden visit on this road trip so I was very pleased that they invited me to visit. Sarah and Matt bought their house 4 years ago. 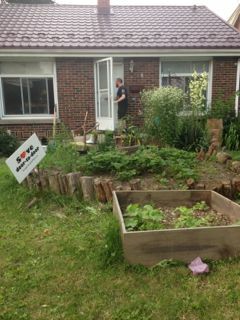 Sarah said she bought the house for the backyard as she knew she wanted to grow their own food! 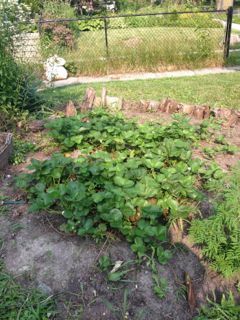 When I first arrived she immediately showed me her patch of strawberries in the front yard. She was proud to say they had been producing enough berries for the family over the past several weeks. 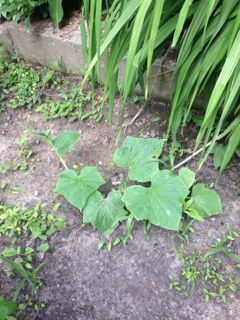 In the front yard there was also a raised bed filled with compost that Sarah had not gotten around to planting any seeds, so it was perfect that the squash had self-seeded. There were 4 healthy looking plants growing. A surprise harvest that she is looking forward to. 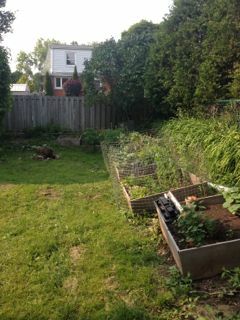 We then went through to the backyard; quite a large yard with compost and shrubs around one side, a huge mulberry tree in one corner and her raised beds along the other side of the yard. 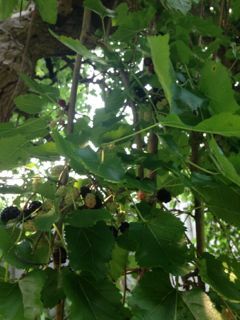 The mulberry tree was at least 50 years old, with the branches heavy with fruit. I had to sample them; they were very sweet and yummy. Sarah also mentioned there were raspberries here when they bought the house. Both were providing lots of berries for the family. She freezes any extra she has so they can use them in the winter months. They did purchase some extra fruit and made their own jam last fall. More canning is on her list of things to accomplish in her urban homestead. 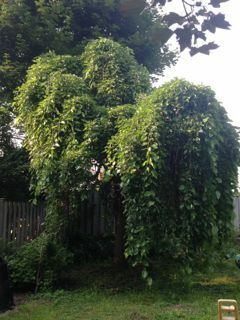 Can you see the mulberries? 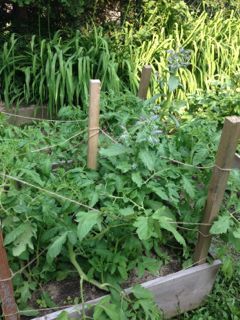 On the other side of the yard are her raised beds filled with an array of vegetables. They made their own soil using the lasagna method -layering soil, leaves, compost and doing it over and over. 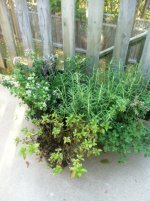 This was an inventive and inexpensive way to make soil for their urban homestead garden. 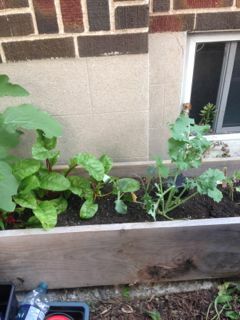 The soil looked rich and Sarah mentioned they do not have to water, the rain they get seems to be all the veggies need. The first bed we came to have peppers growing, they were not doing as well as she had hoped, but the weather had been quite cool and rainy for this time of year; they are needing more sun and heat. 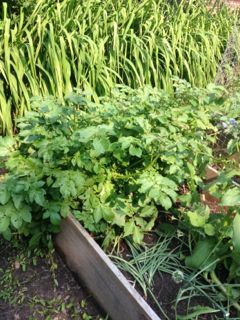 The next two beds were filled with lush tomato plants; they were not flowering yet, also probably due to the cooler weather. Both the peppers and tomatoes are usually harvested late July and into August so there is still lots of time for them to start fruiting. 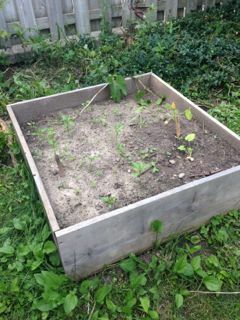 Other beds had potato, onions, peas, lettuce, greens, and squash growing in them. 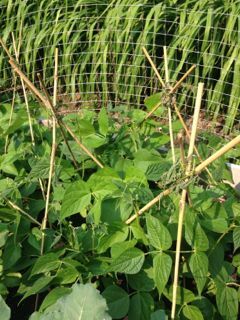 There were cucumber plants on a mound behind the beds, Sarah said the cukes grow a bit wild and fill up the space, which is a great way to keep the weeds down. 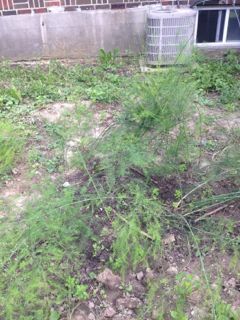 As we walked further around the back yard, she pointed out the asparagus that was planted just beside the back patio. She had some concerns as it was falling down, we talked about mulching it with manure or putting up a little wire fence so the boys did not damage it when they were running around playing. Sarah is a self confessed recycler and a bit of a hoarder. She loves to pick up unused items that people put out at the bottom of their drive. She has found wood, trellis materials, transplant pots, and many things that are useful in a garden. I love to recycle and reuse as well, so we had a good chat about saving money and supporting our planet by doing this. She started all her own seedlings indoors. 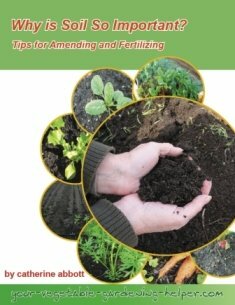 Her growing season is the end of May to early October, therefore usually starts seeds in late winter and early spring months. She places them in the front living room window, which gets more than enough heat and light to get the seeds started. They live in an older area of the city, smaller homes with lots of mature trees around so they have lots of leaves in the fall to use as mulch. She uses them to mulch the beds during the winter months. They have a few small vermin as pest on their urban homestead - mainly ground hogs and raccoons, however with some fencing they pretty much stay out of the garden beds. They are planting some items in the front yard as told above, they also have eggplant, chard and kale in small raised beds to the side of the drive. 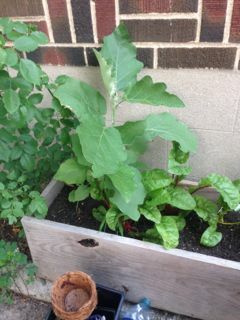 Over the next few years they have plans to expand their urban homestead by growing more items in the front yard. They also have plans to build a raised bed for the boys to use in the backyard. They already have the wood, now just to find the time to get it made. 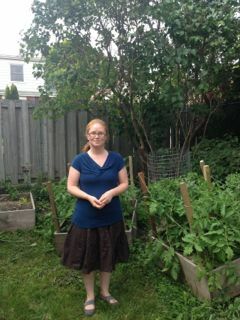 They also have a plan to purchase more fruit trees - apple, apricot, cherry to plant along fence in the back yard. Sarah has a dream to be able to pick and eat as she walks around her back yard. I can see they are well on the way for this dream to come to fruition. Sarah is a very busy stay at home Mom and Matt works full time; they had a desire to grow food for their family and are doing it. I asked Sarah when did she find the time to work in the garden? She said her boys love to be outside so when they are playing she is weeding. 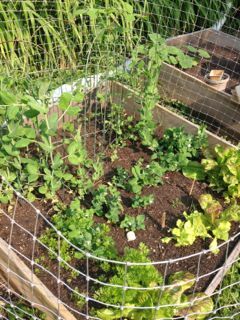 If a busy young family can find the time to make a beautiful, productive food garden all of us who wish to grow some of our own vegetables can do it. I stayed with them for the night; they provided me wonderful dinner and breakfast. I have not spent much time lately around young children and felt very honored to be invited into their busy, cozy, loving home. Thank you Sarah, Matt, Tobin and Mitchell for being fun hosts.